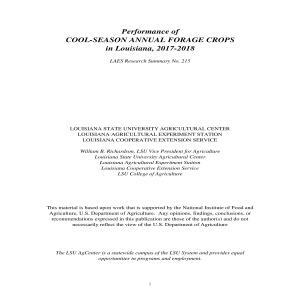 Winter annual forages are adapted for grazing, green chop, hay and silage production in Louisiana. Each year scientists of the Louisiana State University Agricultural Center conduct performance trials to evaluate the forage production of annual ryegrass and oat varieties. Trials are conducted at various Louisiana State University Agricultural Center research stations throughout the state to provide information on the performance of varieties under varying soil and climatic conditions.